Researchers from the Life+ Malta Seabird Project have been out recently surveying the Scopoli’s Shearwaters (Calonectris diomedea) (Ċiefa) in the south of Malta. Scopoli’s Shearwaters, previously known as the Cory’s Shearwater, are increasingly being recognised as a distinct species, with the Mediterranean population being separated from other populations such as those of the Azores and Canary Islands, making Malta’s estimated 5,000 breeding pairs a more globally significant population. At this time of the year, the adult birds are busy gathering food for their demanding chick, sat patiently in the nest waiting for its next meal. However, where adult Scopoli’s go on foraging trips has not been widely researched. Even less is known about movements outside the breeding season. So researchers from the Malta Seabird Project have been able to attach small lightweight devices that will allow them to gather vital information that will help towards the future conservation of the species by gaining a better picture of where birds feed and rest. These small Geolocator tags (GLS) weigh a tiny 1.8 grams and are no bigger than a 5 cent coin (20mm x 9mm x 6.5mm). Being this light means that it will not interfere with the birds daily behaviour or habits. The recovery of the devices is possible due to the fact that adult pairs return to the very same nest site year after year! 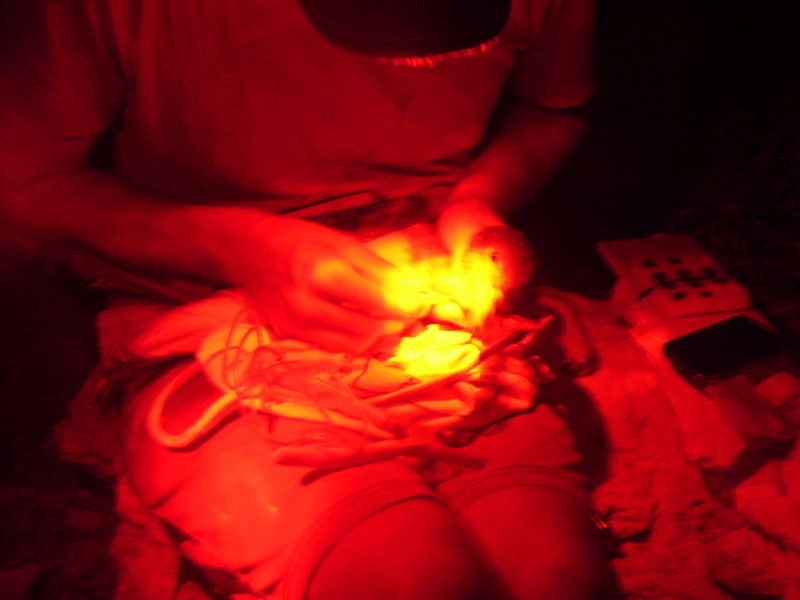 Working under red light to minimise stress to the bird, Ben attaches a GLS tag to an adult Scopoli’s Shearwater. Note: the size of the tags can be seen on the right of the picture! Photo by N.Cox. Over a period of trips to Hal Far, a total of 11 GLS tags were fitted to adult Scopoli’s Shearwaters. Tags were fitted around the metal ring using a cable tie that should be able to withstand the harsh conditions for the birds’ life at sea. The tags can gather data for up to 2 years until the battery runs out and will remain in place until the individuals are caught again. In addition to the deployment of GLS tags, the researchers also took the opportunity to ring a few young Scopoli Shearwater chicks which will help gain vital information on the demography of the species. Nicola Cox is EU Life+ Malta Seabird Project intern since May 2015. Nicola has recently completed an MSc in Endangered Species Recovery and Conservation based at Nottingham Trent University. Her final project consisted of Rat presence/absent surveys upon Alderney, in the Channel Islands and its surrounding islets. This was linked to the possible implications rats could have on seabird populations. Whilst having a general passion in conservation as a whole, it was during her MSc where she developed her interest in invasive species and island restoration. 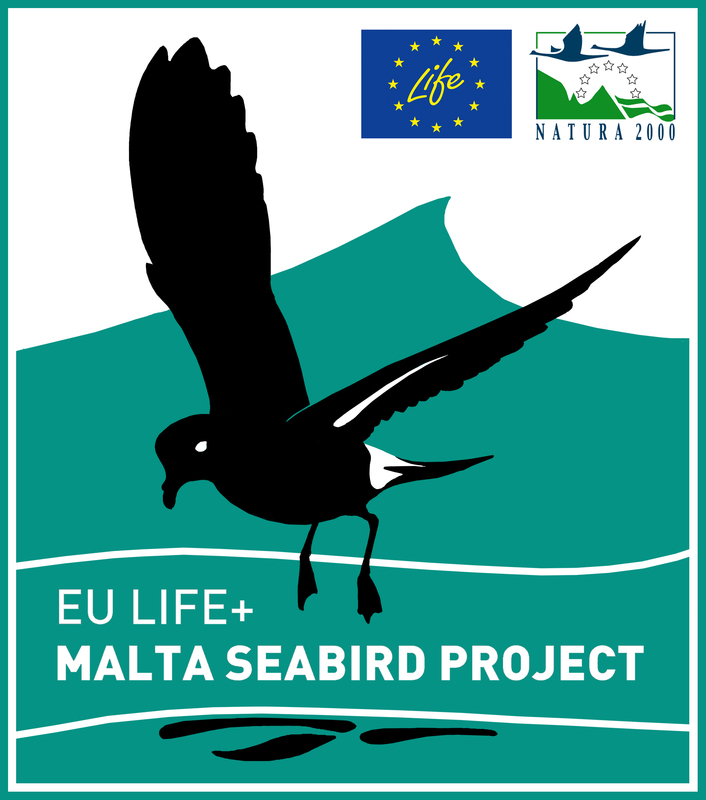 The EU Life+ Malta Seabird Project aims to identify Marine Important Bird Areas for the three species of tubenose seabirds breeding in the Maltese Islands. The project is 50% funded by the EU’s LIFE unit, and is a partnership between BirdLife Malta, the RSPB (BirdLife UK), SPEA (BirdLife Portugal) and the Ministry for Sustainable Development, Environment and Climate Change.